We're getting ever closer to being able to light up the garage for the first time! :) This week we had Nenad on site again, to either install the solar panels on the roof or hook up the inverters, switch boards and batteries. Sadly the weather turned against us and it rained almost all day and scrambling around on the roof was out of the question, so we turned our attention to the inverter wiring. As if that's not complicated enough, I've left a couple of bits out for clarity! The Sunny Island inverter/charger is a tidy unit - Ze Chermans certainly know how to screw together a quality bit of kit. The entire enclosure and chassis is die-cast aluminium, and everything internally is clearly labelled and thoughtfully laid out. Here it is, all wired up with nowhere to go. A nice tidy installation. 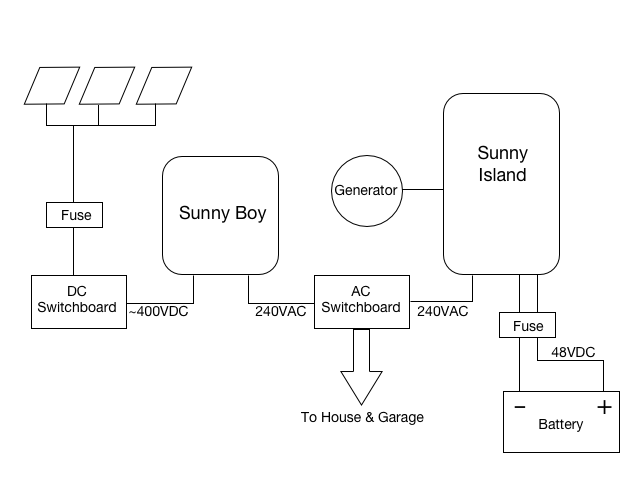 Only the main AC switchboard to finish off and then run the solar cables down from the roof and wire up the DC board. One of the key requirements for powering up the garage is that all the wiring in the walls has to be mechanically protected. That means that it must either run in conduit (which the wiring to the power points and light switches in the garage does, since I'm not planning to line those walls in the near future) or the walls have to be lined. So, on with the lining then! Savva did his best to hinder my progress with his plumbing. All of the drains have been glued in place already, so I have no choice but to work around it. I'm loving working with the plywood lining though - I've done plasterboard before, and this is far, far easier to work with. There's a little more work and care which goes into cutting the sheets, but that is paid back in spades by the plywood's strength and resistance to damage (how easy is it to knock plasterboard around? Reminds me of another brittle and fragile building product I've come to know well recently...). Not to mention the fact I'm not going to have to stop up the plywood with several coats of plaster, then sand in between... There will be a little filler required in places, but that's all. I've got another day or so of lining to go downstairs before we can get the electrical inspector in, but there's at least another day in the installation & wiring of the solar panels, so I'm pretty well on track. Finally in the electron catching business! Two more days until Power!